The Maryland Terrapins have lost five straight games and, after Tuesday’s 13-1 loss to North Carolina, are a season-worst two games under .500. While the Terps (9-11) are struggling mightily, their Wednesday opponent, Elon, is playing its best baseball of the season. The Phoenix (11-9) have won six of their last seven contests, with the only loss coming by one run to No. 17 East Carolina. The Terps were recently swept by that same team, and were outscored 26-4. This past weekend, Elon simply outclassed Rider, sweeping the Broncs and scoring an average of over 15 runs per game. 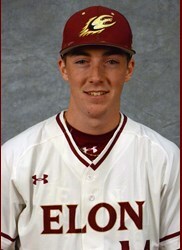 Elon’s hot streak has resulted in skyrocketing batting statistics, perhaps most notably that of left fielder Garrett Stonehouse. The sophomore was named CAA Player of the Week following the series against Rider, during which he went 7-for-12 with four extra base hits, including his first career homer, and nine RBI. After his monstrous week, Stonehouse joined a committee of Phoenix hitters that are batting over .300 on the season. Five of Elon’s nine projected starters are hitting over .300, which just two are hitting below .270. That extensive list of talented hitters includes Ryne Ogren, who has a team-high 22 RBI, is hitting .355 and has started 109 consecutive games in his storied career. The opposite can be said for Maryland’s slumping offense. Even with Marty Costes starting to heat up — he has five hits in his last 11 at bats — the Terps lack the firepower that propelled rallies throughout their successful 2017 campaign. Only one Terp (Nick Dunn) has an average of over .300 on the season while during its current losing streak, Maryland is just 10-for-74 with runners on base (.135). Conroy is one of the best midweek pitchers Maryland has faced this year, and he’s coming off of arguably his best start of the year. This past weekend, the sophomore threw 5.2 innings against No. 17 East Carolina, allowing just three hits and one unearned run. He also struck out seven. Conroy has allowed opposing hitters to hit just .186 in his starts and has struck out 16 batters in 15.2 innings as a starter. The key for Maryland against Conroy will be to attack early. The right-hander’s strength is pounding the zone and getting hitters out via the strikeout.